What are veins and what is their function? Who gets varicose and spider veins? What are varicose vein symptoms? How are varicose veins evaluated (diagnosed)? How can compression stockings help with varicose veins? What are potential side effects and complications of sclerotherapy? What surgical procedures are available to treat varicose veins? Can laser be used to treat varicose and spider veins? What type of doctors provide treatments for varicose and spider veins? How can varicose veins be prevented? Veins carry blood low in oxygen content from the body to the lungs and heart. Varicose veins can lead to aching or even ulceration of the legs. Varicose veins can be caused be weakened valves in the veins or weakened walls of the veins, or by inflammation in the veins (phlebitis). Varicose veins and spider veins are not dangerous (with rare exceptions). Interventions and treatments such as surgery, "ablation" by laser, radiofrequency or other technology is necessary in settings where veins cause significant symptoms that do not respond to non-interventional treatment. Treatments available for venous disease include surgery and sclerotherapy, among other techniques. Veins are blood vessels that return blood from all the organs in the body toward the heart. When the different organs use oxygen from the blood to perform their functions, they release the used blood containing waste products (such as carbon dioxide) into the veins. Blood in the veins is then transported to the heart and returned to the lungs, where the waste carbon dioxide is released and more oxygen is loaded by the blood and taken back to the rest of the body by the arteries. Veins also act as a storage for unused blood. When the body is at rest, only a portion of the available blood in the body circulates. The rest of the blood remains inactive in the veins and enters the active circulation when the body becomes more active and needs the additional blood to carry oxygen to the entire body. This storing capacity is due to the elasticity (flexibility to expand) of the walls of the veins. Veins have different sizes that depends their location and function. The largest veins are in the center of the body; these collect the blood from all the other smaller veins and channel it into the heart. The branches of these large veins get smaller and smaller as they move away from the center of the body. The veins closer to the skin surface are called superficial veins. The veins that are deeper and closer to the center of the body are called deep veins. There are also other veins that connect the superficial veins to the deep veins, and these are called perforating veins. Large varicose veins can be visible, bulging, palpable (can be felt by touching), long, and dilated (greater than 4 millimeters in diameter). Small "spider veins" also can appear on the skin's surface. These may look like short, fine lines, "starburst" clusters, or a web-like maze. They are typically not palpable. Spider veins are most common in the thighs, ankles, and feet. They may also appear on the face. The medical term for spider veins is telangiectasias. Occasionally, restless leg syndrome run in families. Recent studies have shown that restless leg syndrome appears to become more common as a person ages. Also, poor venous circulation of the legs (such as with varicose veins) can cause restless leg syndrome. Varicose and spider veins can occur in men or women of any age, but most frequently affect women in the childbearing years and older people. Varicose veins are very common. Some estimates suggest that about 10% to 15% of men and most older women who have varicose or spider veins. A family history of varicose veins and older age increase one's tendency to develop varicose and spider veins. The causes of varicose and spider veins are not entirely understood. In some instances, the absence or weakness of valves in the veins may cause poor venous circulation (blood flow in the veins) and lead to varicose veins. Valves inside veins normally act to ensure that blood in the veins does not flow in a backward direction (retrograde) away from the large (deep) veins and the heart. They are mainly located in perforating veins and some deep veins. In other cases, weaknesses in the vein walls may cause pooling of the blood. The walls of the blood vessels can become weaker and less competent than normal, causing the volume of blood in the veins to increase, thus leading to varicose veins. congenital abnormalities of the veins. Venous disease (disease of the veins) is generally progressive and may not be prevented entirely. However, in some cases, wearing support hosiery, maintaining a normal weight, and regular exercise may be beneficial. Many people with varicose veins do not have any physical symptoms. They may, however, have concerns over the cosmetic appearance of the varicose veins. Some people may complain of a dull ache and pressure sensation from varicose veins. Some less common, but more severe symptoms of varicose veins may include bleeding, thrombophlebitis (formation of a blood clot within the varicose vein), skin ulceration and a weeping oozing dermatitis or stasis dermatitis. In long standing venous disease, the skin may become fibrotic and scarred, forming an inverted "hourglass" appearance. These complications of varicose veins should be evaluated by a doctor promptly. Evaluation of varicose veins includes a thorough general physical examination by a doctor. This will include asking about any family history of varicose veins, the duration and presence of any symptoms, and any worsening or expansion of the varicose veins. The individual's height, weight, and other medical conditions need to be noted as well. In addition, general inspection and palpation (feeling the veins) and evaluation for the presence of any bleeding or ulceration also is typically performed. Standing up for about 5 to 10 minutes can make the veins more visible, and this may further aid the doctor in assessing the extent of the varicose veins. Can ultrasound be used to evaluate varicose veins? Duplex ultrasound visualization is very useful in evaluating of the venous system. Ultrasound can help in delineating the presence of any defective veins and pinpoint those that require intervention. Doppler ultrasound (a device which can detect and measure blood flow) may also provide additional information such as the competency of and flow through the valves in the perforating and the deeper veins. This information is especially necessary if surgery or other procedures are being considered. surgery (removal of the varicose veins, including "phlebectomy" or vein stripping). In general, sclerotherapy and laser therapy are helpful in treating spider veins (telangiectasias), while ablation and surgery may be a better option for larger varicose veins. No, not if varicose and spider veins are primarily a cosmetic problem. But severe cases that do not respond to compression therapy, especially those associated with ulcers and dermatitis, generally require further treatment. Thousands of people every year consider getting treatment for varicose veins and spider veins. Advertisements for treating venous disease often tout "unique," "permanent," "painless," or "absolutely safe" methods, thus making it difficult for individuals make a decision on the best treatment option. If you are uncertain about the safety or effectiveness of any treatment check with a health care professional. Compression stockings work simply by squeezing the leg, thereby reducing the amount of blood and pressure in the veins. There are various brands, styles, and colors of stockings available. The degree of pressure applied around the leg should be guided by a health care professional. Ideally, they should be fitted when the leg is not swollen, and they can be made-to-order for each patient. Older or obese individuals often have difficulty putting on the stockings, which must be worn when the patient is standing. These stockings typically lose some degree of the compression over time so they may need to be replaced regularly. "Sclerotherapy" involves using a fine needle to inject a substance directly into the vein. This solution irritates the lining of the vein, causing the vein to swell and the blood to clot. The vein then turns into scar tissue that may eventually fade from view. Sclerotherapy is typically used for spider veins and varicose veins. Veins up to 15 millimeters in diameter have been treated successfully. This is generally offered to patients who have tried compression stockings and leg elevation without much success. Today, the substances most commonly used in the United States for sclerotherapy are hypertonic saline and sodium tetradecyl sulfate (Sotradecol), and polidocanol (Aethoxysklerol, Asclera) is now also approved in the U.S. for sclerotherapy. With sclerotherapy, after the solution is injected, the vein's surrounding tissue is generally wrapped in compression bandages for several days, causing the vein walls to stick together. Patients whose legs have been treated are put on walking regimens, which forces the blood to flow into other veins and prevents the development of blood clots. This method and variations of it have been used since the 1920's. In most cases, more than one treatment session will be required. Below are pictures of varicose vein and spider vein treatment. In some patients treated with sclerotherapy, dark discoloration of the injected area may occur (hyperpigmentation). This usually happens because of disintegration of the red blood cells in the treated blood vessel. In the majority of cases, this discoloration will completely go away within 6 months. Another potential problem is the formation of new spider veins near the area that was treated with sclerotherapy. This can happen in some patients, but these new vessels also typically disappear within 6 months. Rare complications may include the formation of an ulcer around the injection site or the formation of small blood clots in the small surface veins (superficial thrombophlebitis). Is sclerotherapy safe for everyone with varicose and spider veins? Sclerotherapy is generally safe for most people for the treatment of varicose and spider veins. However, in certain groups of people, such as those individuals who are unable to walk (non-ambulatory), sclerotherapy should be avoided. Other contraindications for undergoing sclerotherapy include obesity, blood clots in the deeper veins, allergy to the sclerosing agent, pregnancy, and arterial obstruction (blocked blood flow in the artery near the varicose vein). Varicose veins are frequently treated by surgically eliminating the "bad" veins. This forces the blood to flow through the remaining healthy veins. In vein stripping surgery, the problematic veins are "stripped" out by passing a flexible device through the vein and removing it through an incision near the groin. 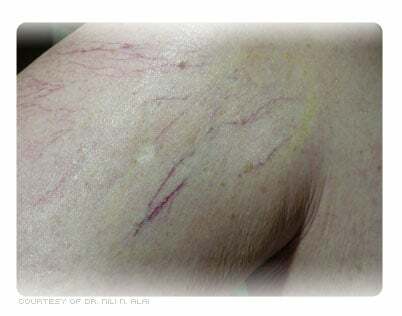 Smaller tributaries of these veins also are stripped with this device or removed through a series of small incisions. Those veins that connect to the deeper veins are then tied off. This stripping method has been used since the 1950's. This is now usually performed using outpatient surgical procedures and rarely requires general anesthesia. Spider veins cannot be removed through surgery. Sometimes, they disappear when the larger varicose veins feeding the spider veins are removed. The remaining spider veins also can be treated with sclerotherapy. For all of these procedures, the amount of pain an individual feels will vary, depending on the person's general tolerance for pain, how extensive the treatments are, which parts of the body are treated, whether complications arise, and other factors. Because surgery is performed under anesthesia, pain is not felt during the procedure. After the anesthesia wears off, there can be some pain at or near the incision(s). For sclerotherapy, the degree of pain will also depend on the size of the needle used and which solution is injected. Most people find hypertonic saline to be the most painful solution and experience a burning and cramping sensation for several minutes when it is injected. Some doctors mix a mild local anesthetic with the saline solution to minimize the pain. Spider veins and small varicose veins can be treated with laser treatment applied from the surface of the skin. The laser applies an intense energy that essentially destroys the small blood vessels in the surface of the skin. Results are variable, and multiple treatments may be necessary to have some benefit. This procedure is generally less invasive than sclerotherapy and vein stripping (no insertion of needles or catheters is required). A possible problem that may arise after laser treatment is a temporary discoloration of the skin. Larger varicose veins may be treated with endovenous (inside the vein) catheter ablation or laser surgery. This basically involves inserting a probe (or catheter) into a large vein in the lower leg (saphenous vein) and closing the vein by applying heat generated through laser. This technique has proven to be less painful, and it also has a faster recovery time compared to vein stripping surgery. Doctors who provide surgical treatments (vein stripping and laser ablation) include general and vascular surgeons. Sclerotherapy and laser treatment are often performed by dermatologists, though some general, vascular, and plastic surgeons also perform sclerotherapy treatment. Individuals may want to consult more than one health care practitioner prior to making a decision on a method of treatment. Be sure to ask the health care professional about his or her experience in performing the procedure you want. Patients should consult their doctor about the safety and potential side effects of each type of treatment. Thoroughly review any "informed consent" forms the doctor gives you explaining the risks of a procedure. For surgical removal of veins, potential side effects include those for any surgery performed under anesthesia, including nausea, vomiting, as well as the risk of post-operative wound infection. Surgery may also result in scarring where small incisions are made, and the formation of blood clots is a potential complication as well. 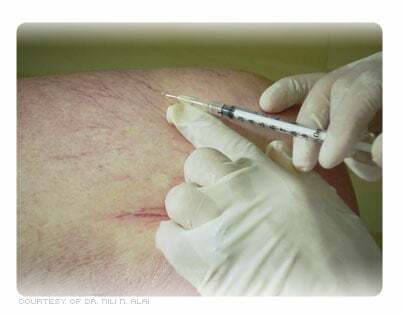 For sclerotherapy, the side effects can depend on the substance used for the injection. People with allergies may want to be cautious. For example, sodium tetradecyl sulfate (Sotradecol) may cause allergic reactions, which can occasionally be severe. Hypertonic saline solution is unlikely to cause allergic reactions. Either substance may burn the skin (if the needle is not properly inserted) or permanently mark or "stain" the skin (these brownish marks are caused by the scattering of blood cells throughout the tissue after the vein has been injected and may fade over time). Occasionally, sclerotherapy can lead to the formation of blood clots. Laser treatments can cause scarring and changes in the color of the skin. The most worrisome complication of all these treatments is formation of blood clots, which may require further treatments, including blood thinners or other treatment, and have a very low risk of causing death. How long do varicose vein or spider vein treatment results last? Many factors will affect the rate at which treated varicose veins recur. These include the underlying diagnosis, the method used and its suitability for treating the particular condition, and the skill of the physician. Sometimes the body forms a new vein in place of the one removed by a surgeon. An injected vein that was not completely destroyed by sclerotherapy may reopen, or a new vein may appear in the same location as the previous one. Many studies have found that varicose veins are more likely to recur following sclerotherapy than following surgery. However, no treatment method has been scientifically established as being free from recurrences. For all types of procedures, recurrence rates increase with time. Also, because venous (vein) disease is typically progressive, no treatment can prevent the appearance of new varicose or spider veins in the future. Is one treatment for varicose veins or spider veins better than the other? ability to tolerate surgery and anesthesia, among other factors. As noted above, small spider veins cannot be surgically removed and can only be treated with sclerotherapy. On the other hand, larger varicose veins may, according to many studies, be more likely to recur if treated with sclerotherapy. Prevention of varicose veins may be accomplished by periodic leg elevation, avoidance of prolonged standing, and wearing elastic support hose. Regular exercise and control of weight can also be beneficial. These measures can prevent or slow down the progression of varicose veins. Fitzpatrick's Dermatology in General Medicine, McGraw-Hill, 1999. What treatments have been effective in treating or preventing varicose veins? Besides their appearance, what symptoms were associated with your varicose veins? Have you had a surgical procedure to treat your varicose veins? Please share your experience. Please describe your experience with varicose veins. Cupping is a type of traditional Chinese medicine that stimulates the flow of chi (qi, or energy) within the body. There are a few different types of cupping: air, fire, wet, and the sliding cups technique. Cupping purports to bring impurities to the skin's surface and remove toxins. Oftentimes, cupping leaves marks, or bruises, on the skin. This is a condition in which vascular malformations, varicosities, and phlebectasia cover an entire limb or other body area. See a picture of Klippel-Trénaunay-Weber Syndrome and learn more about the health topic. The procedure to eliminate varicose veins and spider veins is called sclerotherapy. Generally a salt solution is injected directly into the vein. The solution irritates the lining of the blood vessel, causing it to swell and stick together, and the blood to clot. After a period of time, the vessel turns into scar tissue that fades from view. Learn the connection between your appearance and health. Discover what you can do about embarrassing beauty problems from facial hair to razor bumps.